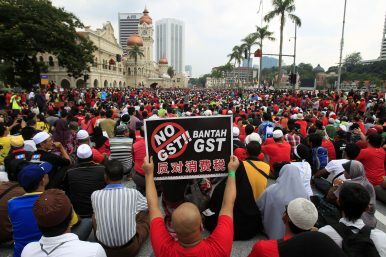 A protester holds up a placard as others sit in front of the historical building of Sultan Abdul Samad during a protest against the implementation of the Goods and Services Tax (GST) in Kuala Lumpur, Malaysia (May 1, 2014). On September 1, 2018, the Sales and Service Tax (SST), the replacement for the Goods and Services Tax (GST) in Malaysia, started to take effect. Currently, there are about 160 countries in the world implementing a GST, while the rest are struggling to conduct such tax reform. It is a surprise, then, that Malaysia became the first to make a U-turn, going from the GST back to the SST. From the economic and technical perspectives, the two types of tax systems in Malaysia are in a close race. However, when accounting for the political spillover, the SST has the upper hand. First, the GST will provide nearly twice as much tax income as the SST. The GST applies to more businesses than the SST; consequently, the Malaysian government could claim more tax income using the GST. According to Customs director-general T. Subromaniam, under the GST framework, about 472,000 companies need to pay taxes, compared to only 80,000 businesses registering with the SST. Besides, a total of 5,445 goods in the consumer price index (CPI) basket will be exempted from the SST, while only 545 are excluded from the GST. Therefore, government revenue in 2018 is estimated at about 42 billion Malaysian ringgits ($10 billion) if the GST continues, but having the SST back in place will drop that number to around 21 billion ringgits. As Malaysia is facing an increasingly serious debt problem, the new administration will urgently need to make up for this revenue loss in other ways. Second, the SST is much simpler than the GST but is less transparent. The GST is a multi-stage tax system but the SST is a single-stage tax system, only involving manufacturers. As a result, the SST is easy for both government and businesses to manage. However, it’s important to point out that, since the GST is a broad-based tax structure, applying the same tax rate on goods and services, it is more transparent, and avoids confusing businesses and the public in terms of imposing different rates on a wide range of products and services. Third, the SST is a business cost while the GST could be disruptive to small and middle enterprises (SMEs). Although the GST imposes tax on multiple stages in the supply chain, business can claim a tax refund. Through such a refund, enterprises could transfer the cost to consumers. The SST has no such refunds; therefore, the SST becomes a cost for businesses – at least for those who are not on the exemption list. Nevertheless, the SST has lower compliance costs for SMEs and it is easy for SMEs to understand and obey the rules. Last but not least, although the SST aims at reducing the cost of living and improving national economic development, up until now, there is no concrete evidence showing that the SST has done better in this regard than the GST in Malaysia. Mostly due to a “tax holiday” from June 1 to August 31, the growth rate of the CPI decreased significantly in August, but it does not mean that living costs have actually dropped. Federation of Malaysian Consumers Associations of Malaysia (FOMCA) advisor Datuk Prof Mohd Hamdan Adnan said he expected prices to remain the same as the SST is imposed only on manufacturers. Moreover, even though there is no study showing that there is a linear relationship between GDP growth and inflation, scholars point out that inflation and GDP growth shows a positive correlation in the short term. The U.S. Federal Reserve and European Central Bank consider 2 percent as an optimal inflation rate and IMF scholars recommend an even higher level, at 4 percent. But Malaysia’s inflation rate in August dropped to 0.2 percent. At the same time, the GDP growth rate in the second quarter in Malaysia lowered to 4.5 percent, compared to first quarter growth at 5.4 percent. Modest inflation is important for healthy economic development, and the Pakatan Harapan (PH) government should take notice of the issue. As explained above, the GST and SST in Malaysia each have advantages in different areas, meaning their economic benefits can be considered roughly equal. The social and economic effects of the SST still need to be monitored for deeper analysis. However, it’s clear that replacing the GST with the SST has generated higher political benefits, making it a must for the new PH administration. Running as an opposition coalition against the long-ruling Barison Nasional (BN), the PH promised to abolish the GST as a political measure to woo voters ahead of the 14th general election in May. The PH Election Manifesto, released in March, listed five pillars through which the PH pledged to “rebuild this nation and fulfill the hopes.” The first pillar was to reduce the people’s burden; abolishing the GST is the first promise to realize that first pillar. Equally troubling, even the increased tax revenues have not stemmed the growth of Malaysian debt. Upon launching the GST reform, Najib claimed that it would increase government revenue, making the country’s fiscal condition more independent from vulnerable oil prices. However, since 2015, the debt problem in Malaysia has only grown and there are no signs that debt has become more manageable after GST implementation. In 2016, the federal government’s debt reached 630.5 billion ringgits, and the number climbed to 686.8 billion ringgits in 2017. As a result, even though the GST is implemented around the world, it is not the right prescription for Malaysia. Because of the unpopularity of the GST and its lackluster results, the Pakatan Harapan decided that abolishing the GST was an effective way to win voters away from Barison Nasional. That is the real reason why the SST has now replaced the GST. Pakatan Harapan listed 10 campaign pledges to be achieved in the first 100 days if successfully elected. “Abolish the GST and take steps to reduce cost of living” was the first among these 10 promises. In order to maintain a good public image and secure voter confidence in these early days of governing, the PH is sparing no effort to realize its 10 promises made to its voters and the public at large. Getting rid of the GST was thus the new government’s first priority. Li Xirui is a research assistant at the China-ASEAN Research Institute at Guangxi University, PRC.